First of all, product design is a very broad domain, which requires extensive knowledge, multidisciplinary skills and a flexible approach. It’s extremely hard to find people who would be able to cover all those essential areas only by themselves. Within product design, you can find a whole spectrum of specialisations. There are visual designers, designers devoted to business analysis, and designers whose speciality is designing motion and interactions. You can read more about it in the following article: "A good Product Designer knows a bit of animation, prototyping, coding, research, visual and interaction design." It’s extremely hard for one person to have all those skills, and it’s much easier to fill the key roles in your product design process with several people. As we mentioned before, product design is all about solving problems. To tackle problems effectively you might consider solving them in a group. First of all, it's easier and faster to get feedback when you have access to a product’s full context. Secondly, two pairs (or more) of eyes will always be better, because people always pay attention to different details, and you want to spot them all. As a result, a team can solve more issues faster and earlier, before they escalate to bigger problems. Working in a group also gives you a chance to use the so-called mutual design critique (when one designer contests the ideas of another designer) – this technique enables you to see drawbacks in your thinking process and gather other visual inspirations. That’s why big players such as Airbnb, Facebook or Google work with design teams instead of hiring freelancers. Working alone, designers always risk being complacent and accepting the first feasible solution they come up with. The best possible solution for the product may be out of your reach, because it was already so difficult to come up with the first one that you just stopped at this point. In other cases, we just can’t go any further without somebody else’s feedback. Sticking with the first viable solution might be more dangerous than you think, because it might turn out to be flawed on a fundamental level. As a result, the whole product may be in danger. You can see this process in the image below. Fortunately, there is a way to avoid this trap – generate as many ideas as possible before you commit to the best option. If you have a team whose members are experienced and knowledgeable, and they trust one another, the idea generation process with will be fast and painless. You also need processes and frameworks to make this happen. At Netguru, we organise product discovery workshops - a variation of Design Sprint by Google Ventures. It includes two phases: a diverging phase and a converging phase. First, we think individually, then we do some brainstorming, and finally, we question each other’s ideas. In the latter phase, we try to design, prototype and test the viability of an idea, product, or feature in a short timeframe. All of the above enable us to get a full design context and help a lot in creating further designs for the product. 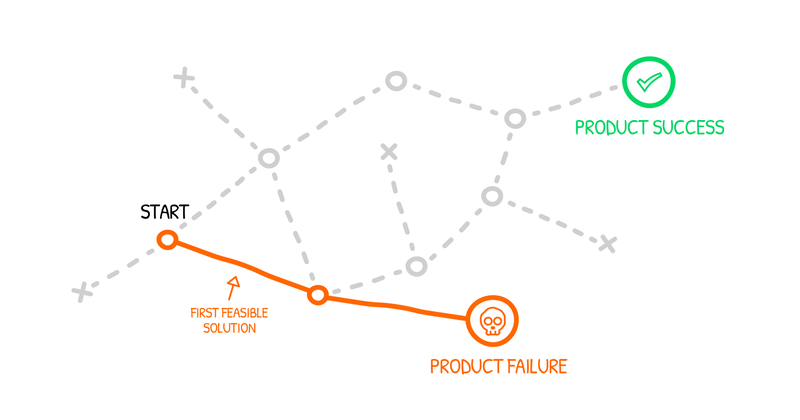 Just like software development, product design is a continuous process. You can create “something” in a week, but it won’t be a reliable solution to your and your clients’ problems. Final designs should always be tested by real users, then researched, iterated and tested again. You have to accept that design for web/mobile is never perfect, because the guidelines, criteria and devices change all the time. What is more, your product will need a long-term support and continuity in the thinking process and knowledge base. You need people who will remember why some decisions were taken. Product ownership is not only the documentation but, what’s more important, a true understanding of the product and the way it works in the real environment. you need a host of people for continuous support and product ownership. A social media app for browsing events in the local area: the client was very attached to the initial vision, but the work with a designer proved that it should be revised. Still, the client chose to stick to the original vision at the expense of satisfying users’ real needs. The project failed in the end because the client couldn’t get users onboard. A media marketplace: the client didn’t understand that product design extends far beyond wireframes and screens. As a result, the client wasted a lot of money, which they could have saved, if they had decided to trust the designer and let them talk to the users to learn how they could meet their needs. Unfortunately, working as a team won’t do away with all your product design troubles out of the box, but it definitely increases the chances of success. I hope you’ve found my article useful. If you have any experiences of working with a team of designers, please share them in the comments below.